A step-by-step guide on how to go from blemished to beautiful. The number one skincare question that I get from women of color is “how do I get rid of dark spots?” In order to understand how to fade dark spots, it’s important to understand why and how we get them. Put simply, acne or any type of inflammatory trauma to the skin can lead to excess production of melanin which causes post-inflammatory hyperpigmentation (dark spots). A good skin care regimen is important to treat this condition. The six elements below will help you achieve a clear, even skin tone. 1. Pre–cleanse your skin — Excess sebum, debris, and make-up can clog your pores and lead to hyperpigmentation. Using a pre-cleanser prior to your cleanser is called double cleansing method. Double cleansing will remove the excess oil and make-up and prep your skin further treatment. Massage a pre-cleanser containing baobab and marula oils onto your face. Then massage in a few drops of water to your face to create a very light lather. Rinse your face with lukewarm water. 2. Cleanse — Use a cleanser based on your skin type. For normal skin, use a cleanser that is for normal skin and for oily and combination skin, use a gel-based or foam-based cleanser. If you have dry skin use crème-based cleanser. Cleansers with glycolic acid, lactic acid, or salicylic acid are great for acne-prone skin. Be sure to wash your face twice a day. Never go to bed with make-up! It can lead to acne and hyperpigmentation. Massage your cleanser into your face in a circular motion and then rinse with lukewarm water. 3. Use a toner — With a cotton ball wipe your face with a toner containing glycolic acid, salicylic acid and/or witch hazel to remove any extra debris that was not removed from cleansing. The toner will soften your skin in preparation for the moisturizer and treatment serum. 4. Moisturize— Your skin needs moisture to maintain its health. Choose a moisturizer that contains ingredients that will help your skin retain moisture like hyaluronic acid, glycolic acid, or emollients like baobab oil and carrot oil. 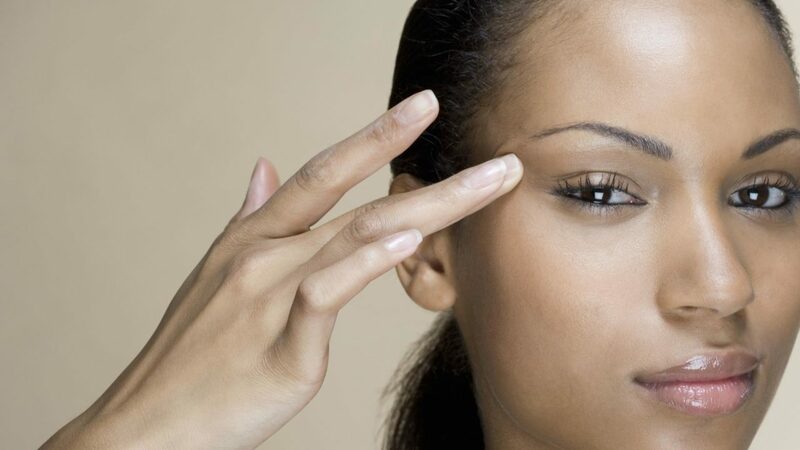 Massage your moisturizer in an upward motion on your face and neck. 5. Apply a treatment serum daily —Treatment serums are the ‘hero’ products for address hyperpigmentation. Look for treatment serums that contain glycolic acid, retinol, kojic acid, and/vitamin C. Ingredients like glycolic acid will do a chemoexfoliation on the skin to increase cell turnover and remove excess melanin on epidermal layer. Retinol, kojic acid, and vitamin c help to reverse the reaction that causes the dark marks. 6. Always wear sunscreen — To prevent the dark marks from darkening even further, wear a sunscreen with an SPF 15 to 30. Apply your sunscreen in every morning 5 minutes after you have moisturized your skin. Remember to be patient with the process. It takes about 6 – 8 weeks to start seeing the results of your skin evening out. Eunice Nuekie Cofie is the founder and chief cosmetic chemist at Nuekie, a company which provides innovative, dermatological products for women of color. Eunice is a World Economic Forum Young Global Leader and has been named by Forbes as one of the “20 Youngest Power Women in Africa.” She is sought-after expert on skin of color and cosmetic science. Follow her on Twitter @eunicecofie.